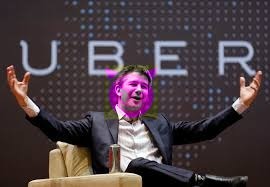 Stories of sexual harassment, defections and resignations of top execs, the CEO actually caught on film giving one of his drivers a really horrible time, potential theft of intellectual property related to driver-less cars, a high turnover rate amongst Uber drivers leading the company to lower its standards for contracted employees (Uber drivers), increased competition from similar services like Lyft, and so on. Uber has also hacked off New York Taxi drivers (hacked get it?) by continuing to pick up and drop off passengers (and removing surge pricing) at New York airports when they were on strike to protest President Trump’s 7 country travel ban earlier this year. Twitter went nuts with #dumpUber as a lot of people jumped on that bandwagon. Uber’s CEO Travis Kalanick quite frankly needs to go. His argument with one of his own drivers (caught on a camera so he cannot deny it happened) was terrible and shows a side of him that says much about the corporate culture of Uber. Their high turnover rate says much the same. High quality drivers are a premium that good companies doing what Uber does should be doing what they can to retain them instead of treating them like disposable commodities. Sexual harassment should not be tolerated for any reason whatsoever if it can be proven. That’s the key. It isn’t enough to just make the claim, it has to be proven beyond a reasonable doubt and those found guilty should face strict penalties for doing so. However for the sake of this discussion, I’ll put it aside until the allegations have been proven or disproven one way or another. Especially since there are other issues that should also disturb those who value their privacy. So let’s talk about what can be proven. Uber has attempted to skirt local laws banning their services with a near spy agency-ish tactic known as geo-fencing. In essence, drawing a circle around offices that regulate services to try and catch regulators using the app to see if Uber was breaking their rules. Users would be tagged or grayballed under a number of criteria and shown fake cars or no cars to attempt to bypass restrictions. They would also sign up to other similar services and request rides and then cancel to tie up their competition with burner phones to avoid detection as well as attempt to discover which of their rival’s drivers also worked for Uber. The most recent revelation was that Uber CEO was called onto the carpet by Apple’s Tim Cook for electronically fingerprinting users of the service even after the app was deleted which is strictly forbidden for iOS. Like with the regulators they attempted to fool, Uber also geofenced various Apple facilities to avoid detection by Apple employees. Uber’s explanation that this was intended for fraud prevention related to stolen phones and credit cards to protect their users did not go over well in Cupertino and they were threatened with the app being banned if they didn’t make immediate changes. I’ve used Uber in San Fransisco, Washington DC, and Boston and in each and every case the drivers were professional, well spoken, friendly, and the cars I was driven in were clean. The drivers ran the gauntlet of race, gender, and religion, and I have not one complaint about any of them. I have to wonder how many of them still drive for Uber with everything that’s happened recently especially considering the high turnover rate. Ride sharing as a concept I’m highly big on. Especially in areas like New York and San Francisco which in my opinion has some of the worst taxis I have ever experienced and I’ve traveled in cabs all over the world. Being one of the first to popularize it, Uber will probably be around for a long time. However I don’t think they’ll be getting my business again anytime soon. But let’s address another issue although briefly. Dragged into this is another company called Unroll which allows people to unsubscribe (or unroll) from various email lists all at the same time. It’s a free service which is said to have ads as part of their monihtazation policy. Well the other thing they do is remove all the Personally Identifiable Information (or PII) from the information they receive about you as part of their service and sell that to other companies. Unroll and their parent company Slice Intelligence used data from not only Uber, but other similar services that they sold to Uber so that Uber could keep track of those users and their habits. Before the outrage button gets pushed again, Unroll and Slice insist that all information that specifically identifies you are removed from all data that they sell to whoever is willing to pay for it. We have their word that this is true and there is no evidence to suggest that it isn’t. Before you blow the dust off your pitchforks and torches, remember this is a free service not unlike FaceBook or Google services that give you something at no monetized cost to you that in order to use you must accept their terms of services. In the case of Unroll, the Terms of Service are actually pretty clear and easy to understand. The bottom line is YOU are not ANY of these companies or products customers. You and your information that you give them so freely ARE the product. This begs the biggest question of all in this still relatively new age of the internet and global information services. How much are you willing to pay or NOT pay to get “free” services? What are your expectations of privacy while using these services? Did you actually read and understand the terms of services for each of these products? If the answer to the last question is no, then don’t be surprised or get upset when these companies do things in their best interests and not yours.